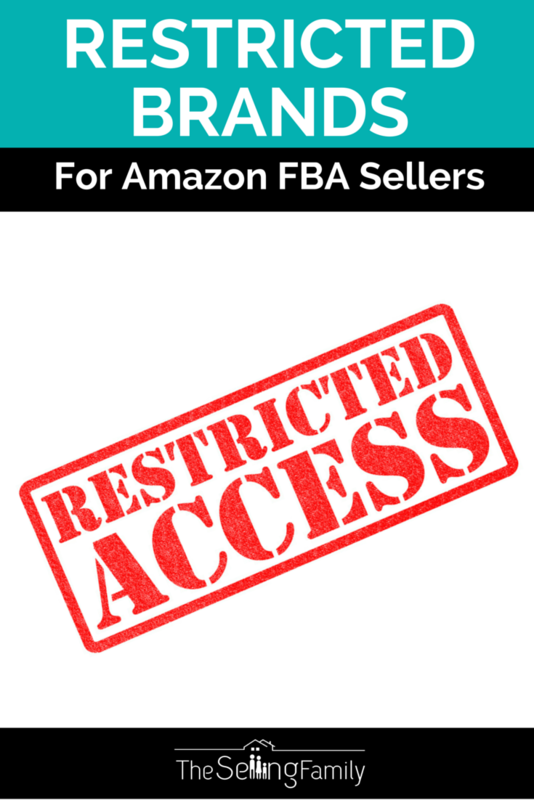 Brand restrictions are definitely not a brand new thing for Amazon sellers to deal with. They've been around since I started selling WAY back in 2009. Norelco is one of the original restrictions I remember having to deal with! Then, a couple of years ago, we saw mass panic amongst Amazon sellers when Frozen toys and Star Wars toys became restricted. So although I know brand restrictions can be very frustrating, trust me it’s not a radically new concept and you aren't the only Amazon seller who's had to navigate them (you can do it!). Why Does Amazon Restrict Brands From Third Party Sellers? Amazon wants to be known as a safe place for consumers to buy with confidence. Unfortunately, some sellers sell counterfeit products and it hurts us all! Restricting regularly counterfeited brands is one way for Amazon to combat the issue. Counterfeiting isn’t the only trouble area either, there are also sellers who will pass off product that’s not in the kind of condition Amazon would like. Like we always say “New is NEW” and “If you wouldn't give it as a gift, it isn't NEW”. But sellers still like to bend the rules and it makes us all look bad, unfortunately. Situations like this mean that consumer confidence is down and people start to question whether they can should even buy on Amazon. There have been news stories reporting that buyers aren’t feeling as confident as when Amazon first started because of counterfeit product and sellers who are bringing in products from China. Amazon has long had a brand registry, where brand owners could go through a process to register a product as theirs and say they didn’t want others to sell it. However, the brand wasn’t actually restricted, which is why some brands would Cease and Desist letters to sellers. Now Amazon is allowing brands to register AND restrict sales by 3rd party sellers on the Amazon platform. This is the proper channel for brand owners to restrict there products. Unfortunately, some seller still resort to sending scathing emails through “contact a seller”…Which is totally a lame process in my opinion! Since Amazon has not provided us with any type of actual list of brands that can't be sold by us, we have crowdsourced our own list! Below you will find all of the brands that currently restrict 3rd party sellers, that we are aware of. We try to keep the list to major brands, and not private label brands as those would almost always fall under brand registry or not want other sellers on their listings. If you find a brand that is not currently on the list, but you have been restricted from selling it you may submit it here and we will add it to the list. Join our mailing list and we will send you a link to our restricted brands spreadsheet and keep you updated on all things "selling on Amazon". You have been successfully subscribed. Please check your email for the spreadsheet link. The list of brands that can or can not be sold on Amazon is constantly changing. This is why we recommend using a scanning app that will show you if YOU can sell an item or not. The app will link to your account and you will know instantly if you are able to sell the product or not, and why. I noticed Disney as well as a few other major name brands are on your list for “Top 30 Stores for Online Sourcing” but are restricted under Toys on this list. Is it just that this list was created after the other? People can get approval in the different brands, so some sellers may be restricted in toys while others are not. What a great list, thank you! One question – I’ve read people’s stories on other websites that report being banned from Amazon for selling a restricted item, when they are apparently approved to sell said item either by direct authorization from Amazon, or by virtue of the fact they are allowed to list it. How does this scenario mesh with the advice you (and other bloggers) give to check items using the Amamzon seller app? Thanks! Most of these brands require “authorization” and are not fully restricted. The case may be different with each brand but in order to “unlock” the brands, for many of them you need to provide some type of credible invoice/receipt to show that the goods you are selling are authentic and can be traced back to the brand. So I would say that most of these brands can be sold, its just a case of satisfying Amazon with the correct information. First of all, unlock the categories and then get authorisation to sell the brand. If items on Amazon are restricted, why am I finding them for sale from multiple sellers? Hi Angie, that’s a great question. When a brand gets reported to us as having restricted 3rd party sellers we list it here as a warning. If a brand is on the list and is still actively being sold on Amazon by 3rd party sellers, it may be further restricted later, but maybe not. I just try to stay away from brands that have actively restricted their listings. Exactly., I don’t believe it’s restricted. The restrictions were probably from the manufacturers but amazon sends out fly by night monsters to resell them anyways because they know there’s a huge market for it. Okay, I am still brand spanking new in the game, right now just reading the 7 day tips before taking the Amazon Bootcamp Course. This may be a premature question, but as I am reading the feedback of others about restricted brands that they’ve already listed, I’m wondering what does one do with merchandise that has to be returned? Is that lost revenue? If for some reason inventory needs to be returned to you, then you can sell it on another platform. If I see a brand name product, and there is only one seller who has been on the listing only, but I can sell it. Should I? Or will I get smacked with a cease to sell order from the brand? Is the other seller on the listing THE BRAND? If so, I would stay away. I’ve always heard that Disney is a restricted brand for clothing and some toys. Why is it not in the list, I wonder? How often does this list get updated? I regularly sell Skullcandy. I saw it on your list (not every item but most I have no problem with) and they usually sell quickly. We actually got a letter from SkullCandy’s attourney, so maybe it depends. Just noticed that one of the popular brand “Now Foods” is in your list of restricted brands list, but this brand is not restricted.. Could you please let us know the reason why you mentioned this brand as restricted.. If we get reports of a product being restricted in the brand, we add it to the list. So you can sell restricted items as used on Amazon? I guess you “technically” can. I wouldn’t bother with it personally. Thanks for the email! After going through the lists, I noticed Nivea is not there and I just was on the phone with Amazon CS a couple of weeks ago because some of my Nivea products became suddenly unlistable. The CS agent told me that they recently restricted their brand to be sold on Amazon . So I had to request those items to be sent back to me. Can anyone confirm this? It easy to see now why you can go looking for products and not find any.Everything is becoming restricted. The good news is all of these restrictions are for all sellers, so you have the same opportunity as everyone else 🙂 I know it can be frustrating, but once you get the hang of it, you will be a pro. I sell The North Face brand for many years and im getting them directly from the manufacturer, I now tried selling it under a new account but no luck and its of course restricted. Im submitting 3 legitimate invoices but nothing helps. any idea if someone can help me solve this issue for a new account im even wiling to pay for it. If you are ordering directly from them, they should be able to provide you with a letter stating you are authorized to sell the brand. When it said “Microsoft” does that mean you can’t sell a used Xbox console? I wanted to sell some Sony headphones and it wanted to charge me $1,000 ouch. Yes, the fees will make it harder for selling one-off type items. If I already have an item in stock that is newly restricted should I pull it? I have a few lego sets up that have been there for a while. I would try to sell them before they possibly get restricted. Why is Amazon charging a fee? Do they give a reason. I’ve ‘heard’ it’s to help them pay for keeping all of this stuff in check. So if I try to add a new product on the Amazon Seller App or website, and it says I can, should that mean I can trust that it will be fine, or not? It means that you are currently eligible to sell the product. I feel like once something is “on the list” it will most likely end up restricted across the board. For the time being, I would not be buying from the orange list for sure, even if I can currently. I see “Disney” is listed under toys as a new restriction. Does that mean ALL Disney toys??? Or those just from the Disney Stores or parks? or??? Any clue? The items I’ve checked are from Disney store, and only some sellers are restricted. So, not totally sure what all it will affect. What does the “fee” mean at the end of those products? Is that a fine we would receive, or we could pay that amount to sell those product? Thanks for compiling this list—It is the first list I have seen. I was contacted and told Colorama is restricted. Thanks, we will add it to the list. I just discovered that Star Wars licensed products are also under restriction, $1500 non-refundable fee to sell them. Just tried to list “Sing-a-ma-lings” and it was restricted but there are other FBA sellers selling them. Yes, this seems to be the case for a lot of the brands. some sellers are seeing it right now, others are not. We are including all brands on the list that have any report of being restricted. Okay, so I have some of the restricted brands, such as HotWheels currently listed. What happens now? I can’t sell them? Some sellers have been affected immediately, while others have not. If I was you, I would try to sell out of them just so they don’t end up restricted while you have a lot in stock. No one knows if some sellers will be “grandfathered” in to some brands or not. I know that I’ve compared with other sellers and some of us are restricted while others are not. I just sold a beats by Dre and did not get a notice. Should I cancel the order? No need to cancel the order. It just means that some listings MAY be restricted. If they are, you wouldn’t even be able to list 🙂 So you are fine. Old thread so I hope you are still around. :>) I sell mostly FBA but was thinking about starting to sell Merchant Fulfilled, my question, can we sell these restricted products if we sell them through the Merchant Fulfilled channel or will our account be compromised by doing so. I see other sellers selling through the Merchant Fulfilled channel so I thought I would ask. Thanks! Wow, I thought your name was familiar, I heard your interview with Pat Flynn on SPI. I didnt connect the 2, nor did I take action at that time. Thanks for all your help! Is there any definitive way to tell if an item is restricted BEFORE you send it in to the warehouse? I have a few things that were flagged once they came to the warehouse, but I’d love to be able to tell before I send something. Does this restriction apply to used items? Hi Jessica, if a brand turns out to be restricted and you can’t return the product that you bought, do you just keep the product, donate it or give it away? For tax purposes, how should it be reflected in your records? I usually just toss it or donate it. I use cash method so it is counted at the time of purchase, not at the time of disposal. I am brand new to this. I just signed up tonight. I have a quick question and sorry if you have already covered this. I had an online store and now have a small inventory that I would like to get rid of. The items are not “household brand names” but high quailty from London. Would this be something that would be sellable and how would I go about posting them on Amazon? Thank you for any info you can give me, thanks. Oh, well that explains a lot. There’s so much incredibly good cosmetic brands that can’t be sold on Amazon, and from a consumer perspective that’s very disappointing to say the least. Thanks for sharing, this was a very informative read, I’ll have it bookmarked. That stinks. Do I request to have those items shipped back to me? Also, where do I look to find out if they are inactive? Will it say it is inactive on my FBA inventory page? It will show up under stranded or unfullfillable inventory. This is at the top of your inventory page. You can have any items sent back, including these. Cost is $0.50 per item. I have a Bliss to send in. Does this mean I should try to have it shipped by April 1 and it will be find, or will the delete the listing? Great list, I will bookmark this page to. Hi, I was wondering if someone knew where to find a list of items that are not allowed to be sold on Amazon? Can I sell a puppy? LOL, just kidding, but you know what I mean. Obviously no guns or fireworks, etc. But what else? ? The reason I ask this is because I have purchased some things on Amazon and later went back to buy the same thing but it was no where to be found. Did it get banned ? ? Jessica. When I scan with PB, will it alert me that an item is restricted? Thanks Dan!! the Amazon Seller App and Scoutify will show you if a product is restricted through your seller account. Jessica I just bought a few Disney art toys and when I scanned them they didn’t come up restricted. Am I ok to sell these? Do any of the apps that are used with smart phones to scan items in the store automatically tell you something is restricted or is this something you can only find out as you are entering the items for selling? Excellent and practical article as always. I’ve been burned by more than one of these and have learned to test, test, test. I just bought a couple Discovery Kids toys on sale. I bought them since they’re already being sold on Amazon, by FBA sellers. Does that mean they are ok to sell? Or, is there someone I could email in advance to find out? I would say they slipped through the cracks and created new listing pages. Michael, I wonder if it is a new vs used thing for beach Body. Since, it is supposed to only be distributed by authorized dealers. Thanks for this list, Jessica. Will go into my FBA bookmarks folder. Do you know if store brands like Harris Teeter or Trader Joe’s are restricted on FBA? I’ve noticed that Kirkland is being sold (Costco store brand). I haven’t heard of any of the store brands being restricted.